Menominee Nation is improving health by reclaiming traditional culture and using trauma-specific interventions to foster healing from historical losses. Addressing both historic wounds and more recent suffering, members of the Wisconsin tribe are using a trauma-informed care model to do their jobs, seeking to find the root cause of negative behaviors. The tribe’s use of a trauma-informed care model to provide social and behavioral health services has dramatically changed life for its members. The approach’s success is among the reasons the Menominee Nation was awarded this year’s RWJF Culture of Health Prize. In 2008, fewer than 60 percent of the students who started as freshmen graduated from Menominee Indian High School. At the time, the “drop-out crisis” was seen as something confined to the schools. Tribal members now understand that the challenge in education was a public health crisis with roots that extend well into other areas of tribal life. With its new lens on how to build a Culture of Health, the tribe has a clearer picture of its needs and a sharper path forward. Today students graduate Menominee Indian High School at a rate of nearly 99 percent. At the nearby Tribal Clinic, Administrator Jerry Waukau (Wendell’s older brother) found that some of the clinic’s practices were alienating patients who needed help. People sought appointments when they were in crisis. If they needed to wait several days to schedule an appointment—that might not help, or might even be too late. “We shifted our approach to be patient-centered and changed to a same-day appointment system. Now you tell me when you want to get in,” Jerry Waukau says. Veteran soldiers take part in the Veteran Welcome Ceremony in Menominee Indian High School, Wis.
For the past several years, Menominee County, which has the same borders as the Menominee Indian Reservation, has ranked 72nd out of 72 Wisconsin counties in the County Health Rankings. The Rankings compare factors that affect health including smoking, high school graduation rates, unemployment, physical inactivity and access to healthy foods and provide a snapshot comparison of counties within every state. The number 72 comes up often in conversation with Menominee Nation members. It’s seen as a challenge. A new grocery store near the high school provides greater access to healthy food in the community. Greenhouses, gardens and orchards have been established at schools to create a direct link between students and the food they eat. Physical education programs have been enhanced in the schools. Employers are encouraging workplace wellness and activity during the workday. Self-led community groups host traditional language, culture and craft events. The tribe is installing sidewalks and streetlights to encourage walking. A man working at a sustainable wood harvesting mill in Neopit, Wis.
A sign at Veterans Park honoring the brave warriors of the Menominee Nation. To understand how advocates applied a trauma-based approach to an entire tribe, one must consider and understand the history of the Menominee Nation. At least 12,000 years old, the tribe once occupied all of what is now Wisconsin and some parts of Michigan and Illinois. Various treaties with the U.S. government carved into its territory, leaving the tribe with less than 400 acres in northeastern Wisconsin. Then the painful time known as “the boarding school era” began in 1860. Children younger than 15 were forcibly removed from their homes and sent to government schools to assimilate to the dominant culture. Cut off from their families, they were not allowed to speak their own language or practice tribal customs. In the wake of the searing indignities that spanned generations, the federal government added one more in the 1950s and 1960s: It revoked the tribe’s federal recognition by passing the Menominee Termination Act of 1954, which marked the beginning of economic and socioeconomic decline for the tribe and the deterioration of its rich culture, traditions and language. The loss of federal recognition brought with it poverty as well as a host of health problems. Traditional tribal businesses, such as logging, suffered as outsiders moved in. The reservation’s one hospital closed, further limiting access to health care. Wendell Waukau remembers standing in lines more than 30 people deep to have a dentist, who only came on Saturdays, check his teeth. 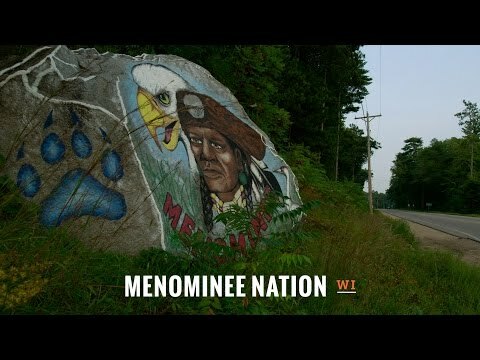 The federal government renewed Menominee’s status as a sovereign nation when it passed the Menominee Restoration Act of 1973, but the damage had already been done. The effects linger, even today. The stresses of the tribe’s past traumatic experiences manifest themselves in many ways. One way the tribe measures the stress is to look at members’ “ACE” scores. Adverse Childhood Experiences include such things as physical, emotional or sexual abuse or neglect, family substance use or abuse, domestic violence in the family, or mental illness in the family. Scored on a scale of one to 10—with one point for each “yes”—the higher the score, the higher the risk of health and social problems. Any score greater than four is considered a risk. Kim Hill, a maternal and child health nurse at the Tribal Clinic, says she was unfamiliar with trauma-informed care, but it makes sense to her now. Raised by her grandmother on the reservation, Hill remembers the Tribal Clinic opening in 1977 and how she clung to a pole outside to avoid being taken in for immunizations. Her grandmother was the clinic’s head housekeeper, and Hill used to visit her at work. Though she acknowledges her own high ACE score, Hill credits her grandmother and her teachers for where she is today. Two Menominee Indian Middle School students laugh as they work in the school greenhouse. A mill worker measures the length of a plank of wood in a sustainable wood harvesting mill. Indeed, teachers can be game-changers in a young student’s life, especially when they recognize the unseen forces that are influencing a student’s behavior. Ryan Coffey, an elementary school teacher and counselor, says trauma-informed care strategies have helped him keep students on track with their education. Before, he says, the students may have derailed, taking their peers with them. A morning mood check-in has been an incredible tool, he says. Before classes begin, students stop by their classroom computer and rate how they feel. Do they best relate to the figure with the red sad face, the yellow one with lips in a straight line or the smiling green one? The process is quick, “but that two minutes can change the whole day,” Coffey says. Teachers then know if someone’s troubled, allowing an early intervention before an incident occurs. The school system also has established “safe zones” in classrooms, usually corners with comfortable seats. If a student is feeling pressured—be it because of a math lesson or an incident at home—the child can take refuge in the safe zone. If that break isn’t enough, the student can leave the classroom and go to the Sakom Room. “Sakom” is the Menominee word for “peace.” The room features books, toys, soft furniture and gentle music. Essentially, the student is self-imposing a “time-out” to cool off and think. Coffey, the peace room’s monitor this year, and another counselor are on hand if the child wants to talk. “It’s about being proactive—before they blow up—instead of reactive. Because these incidents are hard on them, hard on their classmates and hard on their teacher. It’s traumatic for everyone,” he says. Arming young people with the tools to handle their emotions and feelings is not just a short-term fix, Coffey points out. Dental Hygienist Tammy Keller provides students with dental care at the Keshena Primary School. Boys race each other during their physical education class at Keshena Primary School, Wis.
Part of the process of growing, healing and creating a healthier community is about connecting with the past and nurturing the cultural connections that enrich society. About five years ago, Menominee Middle School science teacher Grace Kasper received a grant to create a curriculum centered on the surrounding forest. On that first trip, she told the students to use four of their five senses—taste was out, lest someone devour poison ivy—and record what they experienced. She immediately noticed something: Quiet. As the recent school year began, Kasper unveiled a small greenhouse and raised garden outside her classroom, another grant-funded project. On the first day of school, she told students about “the three sisters.” Their ancestors, she said, planted the three sisters—corn, beans and squash—in the same beds because they worked together to become strong. The corn stalk was there for the beans to climb. The beans added nitrogen to the soil that the corn needed. The squash was a barrier against pests and provided shade to keep the earth moist. Only one student in the class knew the story. She plans to teach a cooking class using items the children have grown. It’s a way to introduce healthy eating and to move them away from fast food. The goal, she says, is to build on the historic connections between the students and the earth. Learn how to build a foundation for health in the classroom from 2015 RWJF Culture of Health Prize winner, Menominee Nation, Wis.